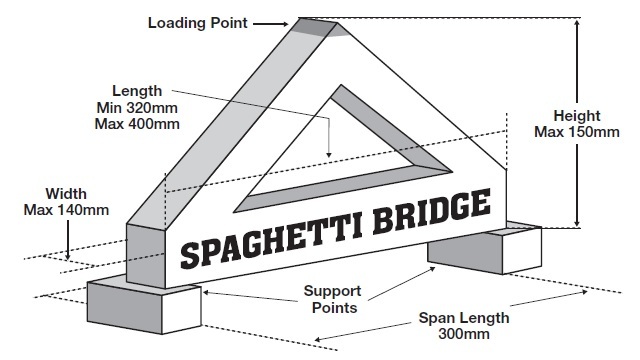 The trusses must be made with only regular spaghetti and white or wood glue. So other pasta shapes are not allowed i.e. linguini. To be eligible for prizes, the trusses cannot weigh more than 350 grams when completed. The trusses will be weighed before testing. Entries must be made by the participant(s). Help from parents, guardians, or teachers will lead to disqualification from the competition. The trusses will be loaded at the centre of their span (length) from the top until they break. No horizontal support will be provided at the support points. The truss cannot bear on the sides of the support points (see picture below). The truss holding the heaviest load wins! If there is a tie, the lighter truss wins!